Now that the Holidays are upon us and the New Year is fast approaching, it's the traditional for people to look forward to the New Year and make new plans. However, most people lose sight of the fact that if you want to receive more in your life, you first need to appreciate what you already have. We are constantly being told this, and like everyone else, I had always pretty much ignored it, letting it go in one ear and out the other. 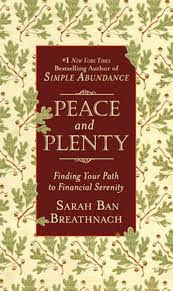 But in the 1990's when I read Simple Abundance by Sarah Ban Breathnach that all changed. It made a big splash when it first came out and it's just as timely today. With the unemployment, financial uncertainty, and general doom and gloom in the world today, we all need to be reminded that regardless of how bad things are, they could be a lot worse. We do have a lot to be thankful for. The problem is that too often we don't take the time to think about what is working in our lives, and that's where her suggestion to start a Gratitude Journal and list five things your grateful for every day can really help. "..... you simply will not be the same person two months from now after consciously giving thanks each day for the abundance that exists in your life. And you will have set in motion an ancient spiritual law: the more you have and are grateful for, the more will be given to you." 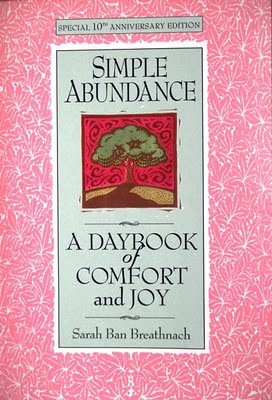 Simple Abundance is a day book. It consists of 365 essays - one for each day - which encourages and inspires you to find a different way to look at your life. Each day starts with a quote and contains a short essay about that particular day's focus. It's geared mainly towards women, but many men have found it useful as well. This is a great time of the year to buy this book, and after giving gifts to everyone else during this Holiday season, it's the ideal gift to give to yourself - to help you start the New Year on the right foot. 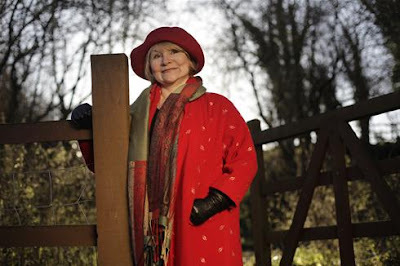 Just spending a few minutes each day reading what she has to say and thinking about it can give you a whole new positive outlook on life, and make 2013 a year of change for you. Change for the better. And even if you don't buy the book, consider taking her suggestion to heart and starting a gratitude journal. 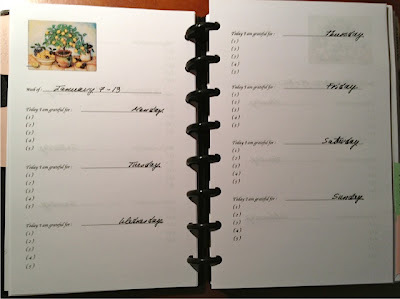 There are lots of great notebooks that you could use for this purpose, but if you prefer to keep your life simple as I do, starting a new section in your planner will work just as well. 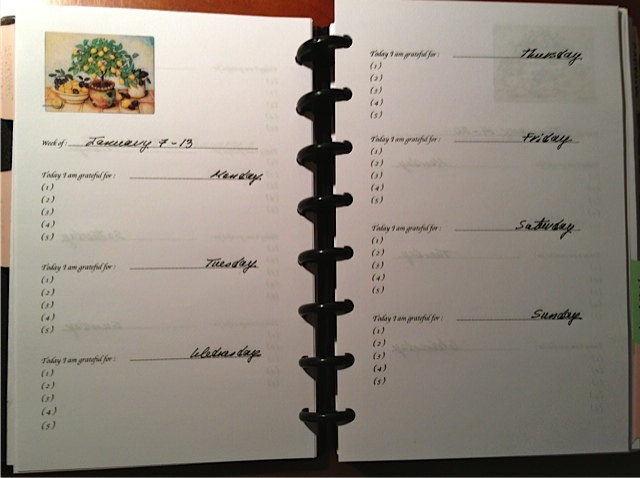 I keep a few weeks worth of pages in my planner, then move them to a notebook that I've set up just for this purpose. When I have a down day and everything seems gloomy and depressing, I can always look through my Gratitude Journal at past entries, see all the things I have to be grateful for, and remind myself that "this too shall pass." If you would like to use my template, it is available for free here. 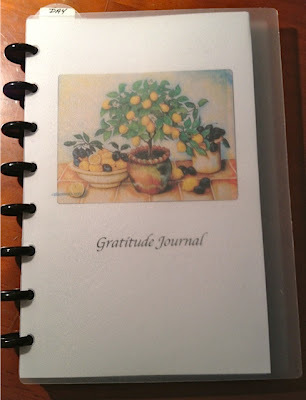 I use this beautiful painting of a lemon tree to decorate my Journal because it reminds me of the saying "If life gives you lemons, make lemonade." (Also, I really love lemons!) But you can insert any image that appeals to you. These pages are set up so you can print both sides of a letter size paper, then just cut each sheet in half. At the end of each day, before you plan the next one, list 5 things you are grateful for on that day's page. Some days this will be a stretch, I know, but there is always something. Even if it's just the fact that you made it through the day, that's one. Having been more successful than most and had more money than most, when Sarah hit bottom it was a lot harder than it would be for most as well. In this book she documents her life since her success with Simple Abundance, and talks openly and honestly about the mistakes that she has made and the price she has had to pay. This new book has gotten very mixed reviews, and I think that's because the world has always been divided between those who have experienced major catastrophes and those who haven't. Many people have a hard time putting themselves in another's shoes. They just can't imagine what it would be like to lose everything. But for those who are going through a crisis of their own right now, this book is like talking to a good friend over a cup of tea. 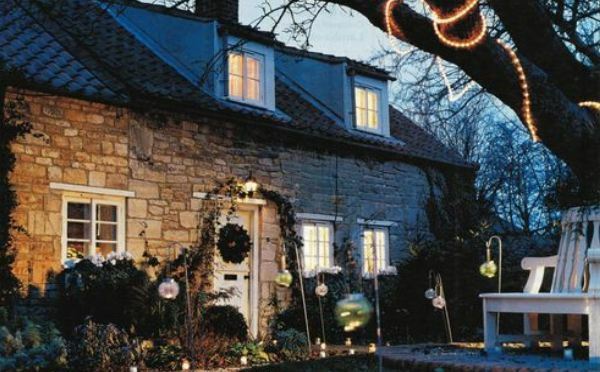 Sarah, like many people today, has lost her beloved home. Now, in her 60s, all her money is gone and she has had to start all over again while camping out at her sister's apartment. She doesn't pretend to be perfect or to have all the answers. But she does know how to be encouraging, has learned how to make the best of things, and to live as happy a life as possible along the way. If you've never gone through hard times, you might find this book depressing, but if you have you will probably find it inspirational. When times are tough, it can be very comforting knowing there is someone else in the same boat who understands what you're going through and can offer advice as well as emotional support. 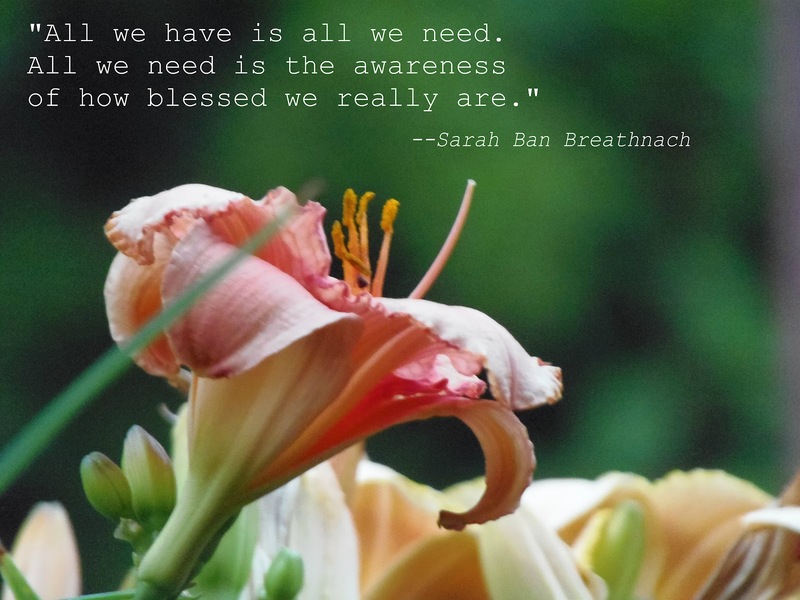 To learn more about Sarah and Simple Abundance, visit her website www.simpleabundance.com and learn about the six graces - gratitude, simplicity, order, harmony, beauty and joy. The new year is the time to make plans and resolutions, and I'll be writing about that next, but before you're ready to do that you need to take stock and start being grateful for what you already have. So start listing those 5 things that you're grateful for every day, starting right now today. Start this coming year on a positive note, and you will be happier for it.